Reincarnation: Many forms for many lives. What is past life regression in simple words? All of us have lived before we were born, but as other people. Think of the birthday candle that you try to blow out, but the flame just keeps coming back. That flame is you. 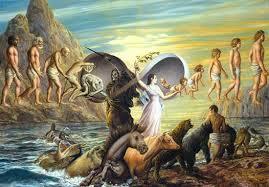 The theory of past lives is that the soul never dies and keeps being reborn into different bodies throughout time. Who were you in a past life? Were you a tribal shaman? A Venetian courtesan? A lady-in-waiting? A model for Picasso? Through past life regression and by using hypnosis, I can help you to remember who you were and why you chose the relationships and situations you find yourself in today. Why have you been interested in such a thing as previous lives? When I was a teenager, I read Gloria Chadwick’s Discovering Your Past Lives. She wrote about karma and how the positive and negative actions of past lives are saved in a karmic “bank account”: interest for good deeds, debt for bad deeds. The interest and debt were called karma. I decided it was time to collect my good karma! Having a challenging teenage life, this book inspired me to be a better person because it taught me that doing good deeds would change my future. Who started to use past life regression therapy and when did it begin? Plato wrote about reincarnation and the immortality of the soul, Swiss Psychoanalyst Carl Jung recalled dreams that described his past life experiences, and reincarnation beliefs have been printed in religious texts ranging from Hinduism to Christianity. Reincarnation was originally in the Bible, but was removed from the New Testament during the 4th and 6th centuries A.D. because the Church felt that multiple lifetimes offered people too many chances for redemption. There is an opinion that in past lives we were not human beings. What do you think about that? In India, Jainists believe that even insects have souls that have reincarnated from another form, so they carry a broom to sweep away bugs in order to avoid stepping on them. It is possible that you were an animal such as a dinosaur or an Egyptian wildcat in a previous lifetime, but in most regressions I’ve conducted it’s the previous human lives that present themselves. We often come back as humans because 1) it’s familiar, and 2) once we’ve already been human, we can continue to learn more through that form. It’s like learning a new language-it’s hard to unlearn what you already know. But past life regression isn’t the same as past life reading, right? What are the differences? In a past life regression, you will experience another lifetime as if you are seeing, hearing, and feeling the experience of the person that you were while you are in hypnosis. Imagine you’re under hypnosis, close to a dream state, seeing the streets of ancient Athens under the Acropolis, hearing wagon wheels charging forward and the sounds of people bargaining at the marketplace as you push through the crowd to see the tragedy of Oedipus Rex. In a past life reading, I would tell you who and what you were before through a process known as channeling, which is similar to self-hypnosis. How does past life regression work? What happens during a therapy session? Imagine your body and mind relaxing more with every suggestion, being taken on an exciting journey beyond space and time, and finding yourself decades before you were born, in another part of the world, experiencing a very different life from the one you have today…all in the comfort and safety of a therapist’s office (or by Skype). What are some of the benefits of past life regression? While some may be interested in past life regression only out of curiosity, I also use the sessions as an opportunity to help heal issues from the past. When you undergo a past life regression, expect to reduce phobias, find out your life purpose, feel more positive, reconnect with loved ones from thousands of years ago, and improve the relationships in your life today. People you feel strongly about in this life were often connected to you in past lives. There are also physical benefits to a regression. If you have trouble losing weight, it’s possible that you suffered from famine or were the victim of sexual abuse in a previous life. Or you may deal with anorexia because you are carrying guilt from a lifetime of overindulgence. Past life regressions can help you discover the cause of your pain and alleviate the symptoms. You can let go of hundreds of years of baggage in just an hour or two! I had a client who worked through five lifetimes in one session. He was able to regain the confidence he had in a past life as a successful banker. He stopped being resentful of his current relationship with an overprotective wife when he it was revealed that she was unable to save him during a plague. He also overcame a fear of drowning when he remembered dying at sea. Recalling a past lifetime as a servant, my client later asked for more of what he wanted at work. He even let go of the fear of losing his loved ones when he recognized several of them in previous lifetimes, assuring him that they would meet again in many more. Can memories from past lives affect our bodies and health? Maybe you have some examples? I’ve had spontaneous past life memories under self-hypnosis of being an early Viking. I’m a petite woman, barely five feet tall, so it was a surprise to see myself as a large, brawny male warrior. At the time of the past life memory, my primary issue was a recurring migraine headache brought on by multiple head injuries. I kept thinking, “Why is this happening to me? Why do I have to have so many head injuries?” When I saw myself in battle as an early Viking, I had smashed a lot of heads. Karma isn’t punishment, it’s life bringing us the circumstances that we created for others so that we can gain deeper empathy. In my current lifetime, I am being given the opportunity to develop compassion for those who suffer from a physical hardship. As a bonus, the more I work to help others who are in pain, the more I pay off my karmic debt and the better my life gets. If a person doesn’t believe in past lives, will the therapy work for him/her? You don’t have to believe in past lives it in order for a regression to work. Past life regressions are a form of therapy like dream therapy. Is it true that we can remember past lives through dreams? Or can we only remember it through hypnotherapy? While hypnotherapy is the most effective way to remember past lives and is certainly safe, there are other techniques for past life recall such as self-hypnosis, automatic writing while under self-hypnosis, and dream therapy. Children are more likely to spontaneously remember past lives because they are not yet overloaded with present life experiences. The busier we become in our current lifetime, the less time we have to think of what came before. But there are exercises that can help you remember. A fun tool you can use to recall past lives is something you can do in dreams. Before you go to sleep, fold a a piece of paper in half. On the front of the paper, write “remember to remember your past lives.” Then sign the paper. You are making a “contract” with your unconscious mind to remember your previous lifetimes. Keep the paper with a pen on your nightstand. Once you have a dream that feels like a past life, record the memory inside the paper that you folded in half. The more you do this exercise, the more details you will remember. It’s like training at the gym: the more you use certain muscles, the better they will work. Is it likely to be born into the same culture again and again? Sometimes we feel comfortable in a certain geographical area or have more work to do in that part of the world, so we may be born into the same culture again. But if you’ve had many past lives, it’s likely that you have lived in a variety of places. Being half Lithuanian and having lived in Europe during most of my previous lifetimes, I still feel more at home in many parts of Europe than anywhere in the United States, where I was born. In my difficult teenage years, I was taken in by a charitable family who had moved from a northern European country to Los Angeles. While under self-hypnosis, I picked up information about their ancestors and they confirmed many things that I could not have known, such as their long seafaring lineage. I later gave the daughter a past life regression and found out that this family was descended from me in my Viking lifetime. While I may have been a brutal warrior, I was also a loving, gentle father. I was kind to my Viking children and 1,000 years later, their children were kind to me.